The Public Accounts Committee (PAC) said the BBC was "complacent" and the project "was flawed from the start". In a statement the BBC said it "strongly rejected" the "notion that there has been any complacency in managing this project". The PAC said the BBC should provide annual updates on the work to "demonstrate it now has a firm grip on the project's costs and progress". 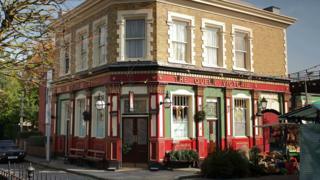 The project to build a new HD-ready Albert Square and expand the external EastEnders set was due to be completed by 2018, but won't be ready until 2023. The building project is codenamed E20, after Albert Square's notional postcode. The PAC chairwoman, Labour MP Meg Hillier, said the BBC had made "fundamental planning mistakes", adding there was an "apparent complacency" with which the BBC approached the project which "is entirely at odds with EastEnders' strategic importance to the Corporation". The report from the PAC points out that the soap is a flagship programme for the BBC but is being "outperformed by its soap rivals, such as Coronation Street, and its overall audience has reduced as fewer people watch traditional linear TV". It adds: "Therefore, it is important for EastEnders that the BBC completes E20 so that the programme is best placed to not only succeed but to also secure its long-term future." "It was a serious error at the outset not to consider exactly what skills would be needed to see E20 through," said Ms Hillier. "The resulting shortfall in key expertise set the tone for much of what followed." In a statement, the BBC said they welcomed the PAC's "recognition of the importance of the E20 project to secure the long-term future of EastEnders", and pointed out the project has "already delivered many vital improvements at BBC Elstree Centre which help other programmes". "However, we strongly reject the notion that there has been any complacency in managing this project. Like any building work of this scale, there have been challenges along the way including construction market issues beyond our control and working on a brownfield site. "We have made improvements to the project and continue to keep it under close scrutiny."